Youa��re in a business meeting or worse yet, interviewing for a new job. You feel the sudden, intense, hot feeling on your neck and face, your heart starts beating rapidly, youa��re sweating, and worse, your face and neck are flushed making everyone aware you are experiencing a hot flash. No, therea��s no mistakea��you are experiencing a hot flash and everyone knows about it!A� As if going through breast cancer was not bad enougha��.So what do you do? Tearing your clothes off, although a perfectly understandable behavior, is not an option. If you are like most women, you prefer a more practical approach to a�?coolinga�? the hot flashes in these types of situations. Youa��ve taken all the preventive measures: staying cool, eating healthy, exercising, doing yoga, meditating, giving up smoking, alcohol, and coffee, but still the hot flashes continue to manifest in the most inconveniencing occasions. But what do you do in that moment? Perhaps, this old method will help. 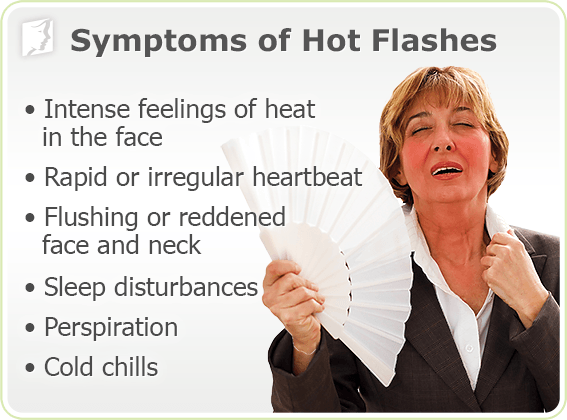 First it makes sense to learn more about hot flashes and why you are having them. Hot flashes remain one of the most frequent and problematic menopausal symptoms that manifest as side effects in women with breast cancer. Hot flashes are more severe in women who have had breast cancer treatment than in women who havena��t. These hot flashes intensify with the use of anti-hormonal therapy, and as many as 15% of the patients will think of ceasing treatment due to these symptoms despite the fact that this therapy can prevent cancer from coming back. Thus, the more knowledge you have about how to manage them, the better off you will be. Some ways of staying healthy include monitoring body fat and keeping it a minimum since it has been associated with increased hot flashes frequency. Exercising regularly can also help keep the weight in control. Moreover, with regular physical activity, women can not only decrease the frequency of hot flashes but also their duration. Another way of staying healthy is through relaxation techniques, such as meditation or yoga. Lastly, smoking (whether active or passive) and alcohol, can increase the risk of hot flashes. What Do You Do if the Preventive Measures Fail to Prevent Hot Flashes? Paced respirations. Yes, you read it right. Paced respirations are slow, deliberate deep breaths that are done for a specific period of time. Paced respirations have been found to help women control hot flashes, not only from menopause, but also those resulting from breast cancer treatment. Paced respiration has shown promise as an effective intervention for hot flashes in several small studies. According to these studies, paced respirations can reduce the frequency and intensity of hot flashes by about 50 percent.A� That may not seem like much, but it may be enough to prevent hot flashes in more than ideal scenarios, like the ones mentioned above. How to Pace Your Respirations? Paced respiration involved training yourself to breathe slowly, deeply, and from deep inside the abdomen.A� It sounds more complicated than it actually is. If you have never done it before, place one hand on your chest and the other on your abdomen. Breathe in for 5 seconds and out for 10 seconds. The hand on the abdomen should rise and fall with the breath, while the one on your chest should not move. This will ensure that your breath comes from deep inside the abdomen. Experts recommend practicing paced respirations at least 10 to 15 minutes twice a day, and when you feel a hot flash is about to a�?hit.a�? Once you master this technique, you can do it without placing your hands on the abdomen and chest, and increase the duration of the breath to in for 10 seconds and out for 20 seconds. Notice that expiration is twice as long as inspiration, so you can decide what length of breaths work for you, as long as you follow this rule. Since paced respirations are not noisy, nobody will be aware that you are doing them or that you were about to have a hot flash. You may experience some lightheadedness so be sure to try it at home and sitting down first. Although the exact mechanism that causes hot flashes has not been delineated, one proposed reason is the acidity of the body. If the body becomes slightly more acidic, you are likely to experience an increase in hot flashes. This can change your breathing pattern, as your reaction will be to hold your breath.A� By practicing pace respirations, you are restoring your bodya��s pH (acidity level) by breathing out the carbon dioxide thata��s responsible for increasing the acidity. As a result, the hot flashes will be less intense and less frequent. You may be asking yourself a�?Why use them if there is not enough research to support it?a�? Because paced breathing is easy and can be done any time. It would be great to have an abundance of research supporting its effectiveness in managing or preventing hot flashes in women with breast cancer or breast cancer survivors. But until we do whata��s the harm in trying this to see if it helps you? Please let us know if you found this interesting and if this technique helps you (or a woman in your life).